Aesch/Switzerland Essemtec AG, a leading manufacturer of surface mount technology production equipment, announces that it will highlight SP900 inline printer in booths A5-277 and A5-278 at the upcoming Productronica 2007 exhibition and conference scheduled to take place November 13-16, 2007 at the New Munich Trade Fair Center in Munich, Germany. SP900 In-line printer is automatic and sophisticated enough for high-mix/high-speed production. The printer is designed for multi-shift operation with a minimum of service. The integrated stencil cleaner is programmable, and closed ball rotation spindles drive the maintenance-free print head. All moveable parts are protected against dirt. The printer is very flexible and provides a fast changeover. Additional features include reliable and precise printing, user's choice of lighting color, board thickness from 0.33 to 5.0 mm, automatic stencil entry and alignment, and automatic width adjustment. Also, the system can accommodate stencils or screens up to 29 x 29". SP900 offers accuracy of 10 mm. It precisely centers stencils on the substrate. Additionally, both reference tag and print structures can be used for adjustment. The unique dual-camera system compensates for stencil distortion or board variations. For maximum contrast, the lighting color of the vision system is programmable (RGB LED illumination). All the inclusive print parameters transport widths are programmable. The stencil loading system automatically draws in the stencil frame and positions it correctly, and the width of the transport system automatically adjusts. Essemtec is a worldwide leader in the manufacturer of Surface Mount Technology (SMT) production equipment. 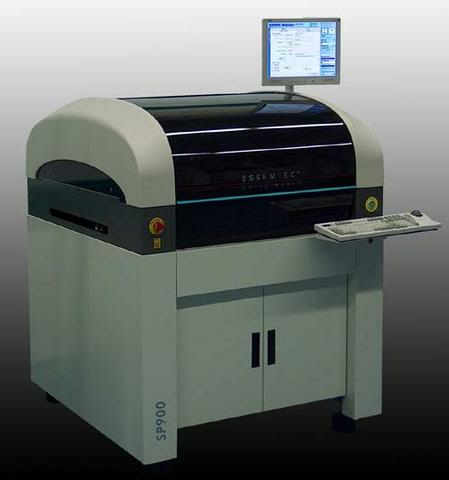 Essemtec specializes in high mix production equipment for Printed Circuit Boards (PCB) using Surface Mount Technology. Essemtec is the only manufacturer to cover the entire production process, from Printers and/or Dispensers, to Pick-and-Place and Soldering equipment. Therefore, customers benefit from unparallel knowledge and the ability to select, from a single source, a complete process solution to meet their requirements.